One of the finest maps of New York and New England to appear in the 19th century. 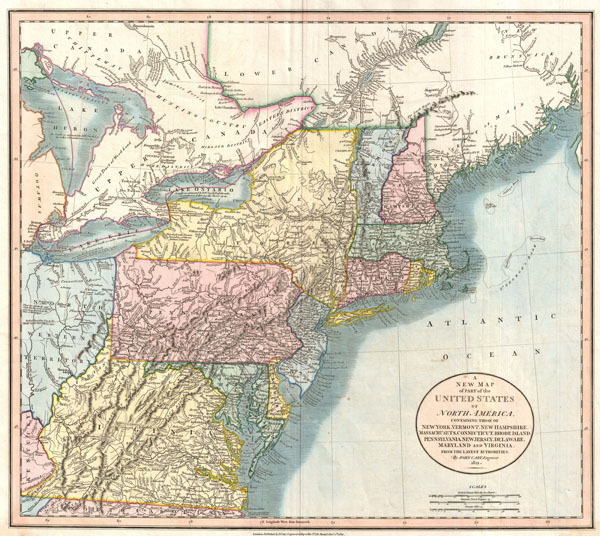 Published by John Cary in 1821, this is one of the most interesting atlas maps of the north-eastern parts of the United States to appear in the early 19th century. Centered on New York and Pennsylvania, Cary's map covers from Lake Huron southward as far as Virginia and North Carolina and eastward as far as the Atlantic Ocean. This map includes the modern day states of Maine, New Hampshire, New York, Vermont, Massachusetts, Connecticut, Rhode Island, Pennsylvania, New Jersey, Maryland, Delaware, Virginia, West Virginia and Ohio as well as parts of Ontario and Quebec. The most interesting parts of this map are the north-western quadrants which are dedicated to the Great Lakes and the North Western Territory. The Great Lakes are rendered in accordance with the research produced by D. W. Smith, the surveyor General of Upper Canada, who was assigned to survey Lakes Ontario, Huron, and Erie in the late 18th century. In modern day Ohio, Connecticut's Western Reserve is noted. The reserve, formally ceded to Connecticut after the Yankee-Pennamite Wars, was the last remnant of Connecticut's old colonial grant of all territory, from sea-to-sea, falling between the 41st and 42nd parallels. This map also includes numerous references to the American Indian nations occupying the region, including the Chippewa, the Ottawa, and the Six Nations. The 'Indian Boundary' is shown bisecting the North West Territory. Created by General Wayne's treaty of 1795, this boundary line proposed to denotes the southern limit of American Indian lands in the North Western Territory. Prepared in 1821 by John Cary for issue in the 1821 edition of the New Universal Atlas. Cary, John, Cary's New Universal Atlas, containing distinct maps of all the principal states and kingdoms throughout the World. From the latest and best authorities extant. (London) 1821. Very good condition. Original centerfold. Blank on verso. An exceptionally fine example. New York Public Library, Map Division, Map Div. 97-6137. Phillips, P. L., A List of Maps of America in the American Library of Congress, p. 875. Sames, J.W., Index of Kentucky & Virginia maps 1562 to 1900, p. 117. Rumsey 1657.057. Manask, F. J., Collecting Old Maps, no. 94.